A mob of starving people advanced on the presidential palace chanting, “We want food.” They were met by soldiers and police dispatched by the tyrant from his lavish palace decorated opulently with a golden sun, giant rock crystal mirrors, sparkling chandeliers and towering oil portraits. Obama laughed and joked with deceased monster Hugo Chavez, who handed him a copy of the anti-American tract, “Open Veins of Latin America” that had even been disavowed by its own author. Obama called the book a “nice gesture,” but Eduardo Galeano, its author, had told an audience that the left “commits grave errors” when in power. Chavez had been none too tightly wound; claiming that capitalism had destroyed life on Mars, that Jews run the world and that his cancer had been caused by America. 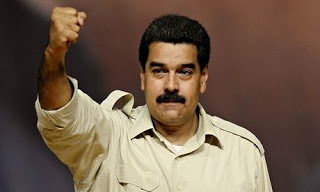 His successor, Nicolas Maduro is insane. Maduro claimed that his deceased predecessor appeared to him in the form of a “little bird” and on a subway wall. He showed off the photo of the wall on state television while crying. The military elite receive special food privileges. In a country where bread and butter have become distant memories for many, the guns used to oppress the Venezuelan people are paid for with butter. And the people are fighting back. The government calls its crackdown on starving people “Operation People’s Liberation”. The people however want to be liberated from their socialist liberators. The popularity of Bernie Sanders is based on many of the same empty promises of freebies for all that made Hugo Chavez such a hit. Venezuela is a model of how well that works out in real life. Socialism is increasingly popular in America. 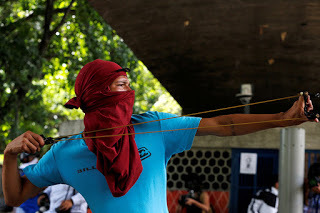 Meanwhile in Latin America, socialism kills babies and drives starving mobs to demand food outside the presidential palace under the guns of the regime’s soldiers. 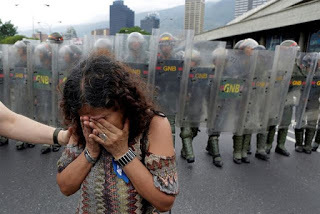 — Why the Left Ignores the Collapse of Venezuela was originally published at To The Point News.